Decorating a children's bedroom, whether a nursery or a child's sanctuary, means you can be bold and exciting with themes, colours and furniture. The thrill of giving your child their dream bedroom in your new home can add to the pleasure of the move and will help make the whole experience more exciting and magical for your little ones. 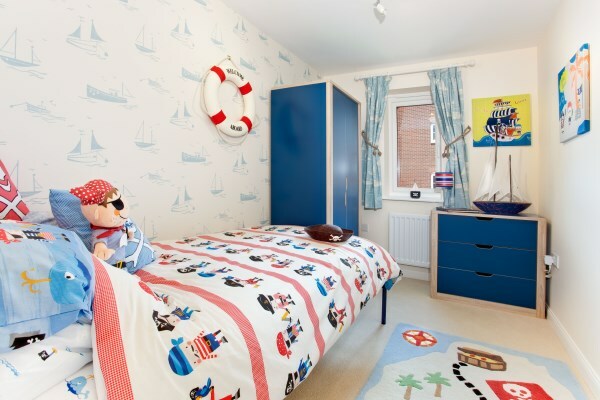 Designing your child's bedroom is an exciting project, and needn't be an expensive project. We've pulled together some ideas that will help inspire you. Your baby will spend quite a lot of time looking at the ceiling of their room so why not make it colourful and interesting? Painting the ceiling blue and then sponging on white fluffy clouds is simple to do and creates a lovely summer sky for your baby to gaze at as they lie in their cot. You could also add glow-in-the-dark stick on stars to give a night sky effect. Add colourful curtains, cot bedding and wallpaper to create a stimulating environment for your baby. Whether you're designing a room for a boy or girl, the themes available are endless. You could also carry on the outdoor theme by choosing kites, animals or hot air balloons as a theme. Use wallpaper on one wall to create a focal point in the room without overwhelming the space with a busy pattern. Pick out your favourite colour from the fabric or wallpaper design you choose and use this as a plain colour highlight in the rest of the room. This is also a very time-efficient way to add a bright feature to the room without the worry of having to remove lots of wallpaper when your child outgrows the design or theme. If you are handy with a sewing machine, you could use the same fabric to make the curtains and the front of cushions for the bedroom chair; you could also use it for the cot cover. Remember to line your curtains or blinds with blackout material. This means you can make your baby's room dark even in the long summer evenings so getting them to go to sleep will be easier. Keep the other walls, furniture and floor covering pale so the focus is on your carefully chosen designs. Stencilling is a cost effective way to brighten up a wall and create a statement piece. They're easy to do with plenty of kits available from the high street and online. Simply paint within the designated area and watch the image appear under your paintbrush. It's also easy to paint over a stencil when you or your children get bored of them and fancy something new to match the new theme or colour scheme. This is where you can have fun with their rooms! Let them have input as this will be their place to play. Make sure the room doesn't feel too swamped with colour, as this is also their space to rest and relax after a hard day of growing and learning. Colour can come from coloured rugs, curtains, duvet covers and wallpaper. Why not make a feature out of a piece of furniture? A bed can also be a pirate ship, a racing car, a circus tent, a spaceship or a castle, making your child's room a very special place and the envy of all their friends. Use two or three large triangles of fabric suspended from a small hula hoop or wooden hoop, securely attached to the ceiling by a hook over the head of the bed. Decorate the edges of the material with bunting and cover the hoop with extra fabric. Add suspended pretty paper pom poms and stars and you have the ingredients for a fairy-tale bedroom. Make the most of the space with splashes of bright colour to liven up plain walls. Murals across a wall will make a statement, whether clouds or scenes such as an alien invasion; a child's bedroom can be a magical place where their imagination can run riot. If pirates fascinate your children, why not suspend white material from a pole with pieces of rope to make sail bed heads, and add skull and cross bones flags? This is relatively simple to make and can look really effective. Striped bed linen, boat shaped shelves, anchor lamps and a rug featuring a map with X marking the spot would complete the look. If you are considering bunk beds you could get more adventurous and clad the beds in hardboard shaped and painted like the side of a ship; a bed with storage and play space built in! This same approach can be used to create a variety of themes but we recommend getting a professional to build exactly what you want. Teenagers will have very definite ideas of how they want their space to look and feel, but parents can help guide them towards things that work best in their space. Most will want the space to reflect their personality and interests but make sure they have enough room for their many interests. 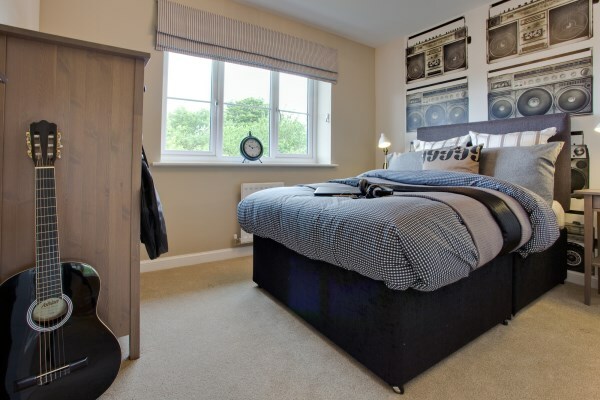 Their bedrooms will be the ultimate expression of themselves, so be prepared for plenty of colour and accessories popping up throughout the room! Displaying photos of friends and family is always popular, such as hanging prints from decorative ribbon washing lines, making photo montages and framing favourite shots. These all add interest to the walls. Another great way of creating a different atmosphere is through changing the lighting. Move away from overhead central lighting and add fairy lights or paper lanterns where the light is diffused, creating a great sense of atmosphere. Lava lamps also add colour and a retro vibe. A big pin board over the desk is practical and can be a great way of displaying favourite images as well as college timetables. Photos displayed under a piece of toughened glass cut and finished to fit the top of your teenager's desk creates an individual work station. Shelves don't need to be boring; they could be made of wood, plastic, metal or glass, be flat, curved or box shaped and arranged imaginatively across a wall, making a feature out of function. Personalising a room doesn't need to be expensive. 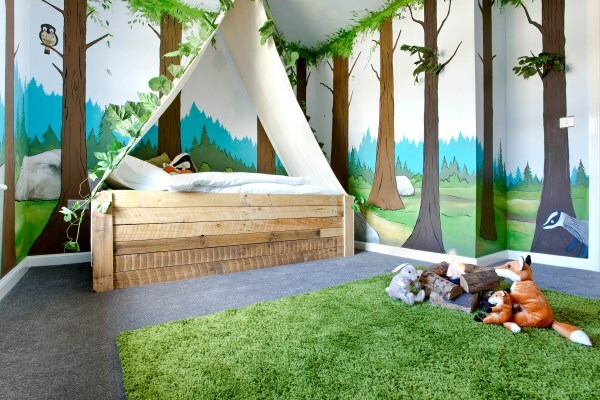 A simple change of wall colour, stencilled designs, display solutions, storage and soft furnishings can create a completely different atmosphere relatively cheaply, whether your child is a new born through to a young adult.